Harald Pfeifer has been appointed as Professor of the Research Centre for Education and the Labour Market (ROA) at Maastricht University. This bolsters cooperation in research into economic issues relating to vocational education and training. Harald Pfeifer was awarded a professorship in the “Economics of Vocational Education and Training” at Maastricht University on 1 June 2018, in which capacity he will be based at the university’s Research Centre for Education and the Labour Market (ROA). The aim of instigating such a chair is further consolidation and enhancement of the successful and long-standing cooperation arrangements between the Federal Institute for Vocational Education and Training (BIBB) and the ROA at Maastricht University. 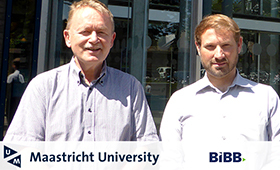 "The appointment of Mr Pfeifer will reinforce cooperation between BIBB and Maastricht University in matters relating to the economics of education. The topics being addressed by Professor Pfeifer and the ROA are more relevant to VET than they have ever been before." BIBB and the ROA have already been working together for more than ten years. The main focus is on mutual research activities in areas such as the costs, benefits and financing of company-based training and economic aspects of vocational education and training. Various joint publications have appeared over the past years, and a total of three doctorate projects have also been successfully completed. The aspiration is that the recent appointment of Harald Pfeifer to a professorship at the ROA will further strengthen research cooperation in terms of content.